If you’re like us, you’ll have had strong opinions on recent developments involving BBC3. The channel has been a breeding ground for some of the best new talent in the UK, both actors and those behind the scenes alike. Whether its move to online-only is successful remains to be seen, but we still have a long way to go before that happens in Autumn 2015. Until then, we have the opportunity to enjoy what BBC3 excels at – comedy. One of the channel’s most talked about shows is Bluestone 42, currently airing its second series. Following the lives of bomb disposal experts in Afghanistan may not sound like an ideal subject for laughter, but Bluestone 42 follows in the footsteps of M*A*S*H and Blackadder Goes Forth in treading that fine line between the realism of war and the comedy that can come out of tough situations. 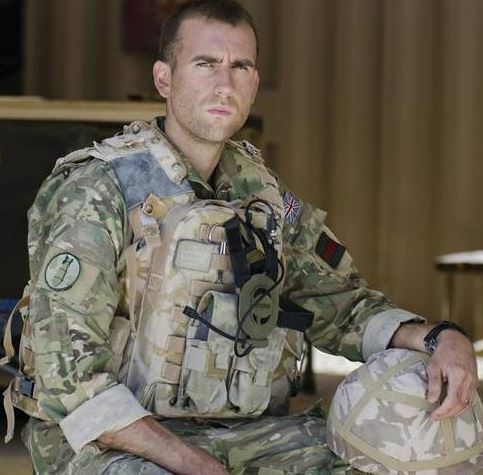 Flicks And The City talked to James Cary, co-creator and co-writer of Bluestone 42, to find out about the challenges of capturing real life on screen, the addition of Matthew Lewis (Neville in the Harry Potter films) to the current series, and his thoughts on the BBC3 developments. What were your aims going into series 2 of Bluestone 42 compared to the first series? The aim was really to do more of the same, but bigger, bolder, better and funnier. It’s sounds silly, but we wanted more comedy and more drama. All within 28 minutes. And also we knew we could push it a little bit further because we had won some respect from serving soldiers who respected that we’d gone out of our way to make it reflect how army life on tour actually is. Obviously, we can never truly capture that, but making sure the kit is correct and that Bluestone 42 observe Counter-IED procedures is really important. The moment you start departing from truth – or truthiness – the comedy can start to ebb away. The cast has mostly stayed the same apart from the addition of Matthew Lewis (Harry Potter). What does he bring to the table? Firstly, Matt’s as nice a guy as you could hope to meet. And he loves comedy and had watched tons of it, so despite being a movie star in the biggest franchise of all time, he understood the genre and really went with it. He’d seen Series 1 and thought that this was the kind of show he’d actually want to be in, so it was fortuitous that the opportunity arose. As his character Towerblock, he makes Nick a bit uncomfortable. His predecessor, Millsy, was a Mr Perfect who was on top of everything and really respected his boss, but Towerblock is altogether different. Nick has to win his respect, and by the end of episode 1, he almost has. But there’s that edge of class divide and north/south divide that is always fruitful in comedy, because it’s still an issue in society at large. How difficult is it to maintain the balance of comedy and drama in the show? It can be tricky to balance and combine the two. Overall, [co-creator & co-writer] Richard Hurst and I are all about the comedy. That’s why we wanted to do this show, but comedy relies on truth. The moment the situations feel too fake or contrived, it distances the audience and it’s less funny. Richard and I met writing for Miranda so our job there was to work out with Miranda Hart how to get these ludicrous situations without it feeling contrived. Our world is a little different in Bluestone 42, but the same rules apply essentially. The dramatic element is exciting and an opportunity to do something in a sitcom that doesn’t revolve around a sofa or a cafe. But the drama is ultimately there for the realism and truth, so that we believe the characters more, love them more and so laugh more. We’ve done our best to make it reflective of some aspects of army life. We’ve done our best with the kit, with procedure, getting ranks right and all that. We check everything with our military advisor both at the planning and script stage, and on set when we’re shooting. What is harder to capture is the missing home stuff, mainly because it’s hard for the audience to empathise with our characters missing people we’ve never met or seen. We had Simon’s fiancee stuff in Series 1, which worked quite well because it was building up to a wedding, but Series 2 is probably a bit lacking in the missing home stuff. We’ve found that tricky to make work. Do you find audience perception of the show changed once they gave it a chance? There was some slight offence at the idea of an army comedy, but that seemed to mostly be from people who had never even watched the show. Yes, not that many people seem to have really objected to the show once they’ve seen it. On Twitter there are occasionally remarks that some find the show to be in poor taste, and I understand that. Especially if you have relatives serving overseas. 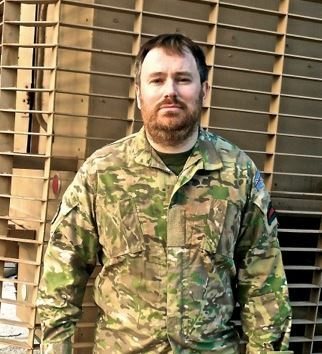 But many have found it cathartic, and lots of soldiers are pleased that their relatives can see what the appeal of the army is – the close team relationships, the banter and getting to use some interesting kit, as well as try and keep the peace in a difficult part of the world. Ooh, that’s tricky. That’s like asking me to chose which of my children is my favourite! Lt Col Smith is good fun to write for because his lines are often very bizarre and he is unlike any other character I’ve written. I also enjoy writing for Mary the Padre because in some ways, I feel her reactions to situations on the base would be a bit like mine (because I’m also a Christian). To be honest, though, the most exciting thing about a second series is that the characters are in your heads and writing their lines is much more instinctive. When you set up a situation, you can almost hear Nick, Mac, Rocket, Simon, Bird and Towerblock chipping in with funny lines so I’m wimping out and saying I don’t have a favourite. Could you give us any hints about the rest of the current series? Now that would be telling. Just watch it. All the way to the end. How do you feel personally about the recent news that BBC3 is to become an online-only channel? Naturally it’s a bit alarming to hear the news that the plug is being pulled on your channel, although it’s all staying the same for 18 months. We’d like to keep making Bluestone 42 for as long as possible as it’s great fun and the audience seem to enjoy it. Naturally during a time of cuts, everyone fights their corner and says why their part of the BBC shouldn’t be cut, so there’s no point me defending BBC3 in a partisan way. It is shameful how the government bullied the BBC into a huge last-minute licence fee cut behind closed doors. The way it was done was extremely odious. The only good thing is that they’re stopping relentlessly cutting budgets and expecting people to deliver more quality for less money. The budget on Bluestone 42 is incredibly tight and it’s amazing how the show is wrung out of the budget by our producer, Michelle Farr and her team, especially [production designer] Harry Banks who is behind everything you see on screen from the base and the kit, to the military vehicles that were essentially built from scratch – and look amazing. Having said all that, I can’t imagine that online BBC3 programmes will have the same budget as BBC1/2 programmes, so there are some tricky times ahead no doubt. But all of this stuff beats pulling IEDs out of the ground. I’m really keen to crack the BBC1 pre-watershed family sitcom. I know that seems crazy given the style of the show I’m currently writing and the ‘robust’ language. But I’ve co-written the first two series of Miranda, and wrote an episode of My Family. And six episodes of My Hero some years ago now. So it’s an area I’ve always enjoyed. It’s partly being re-inspired by watching Modern Family. And it’s partly the challenge of the job because I think writing a show that pleases 9 million views in today’s fragmented TV market is the hardest job of all. And I like a challenge. Bluestone 42 airs on Thursday nights at 10pm on BBC3, and is also available on BBC iPlayer. One comment for "James Cary On Writing Bluestone 42, Audience Reactions, & The Future of BBC3"